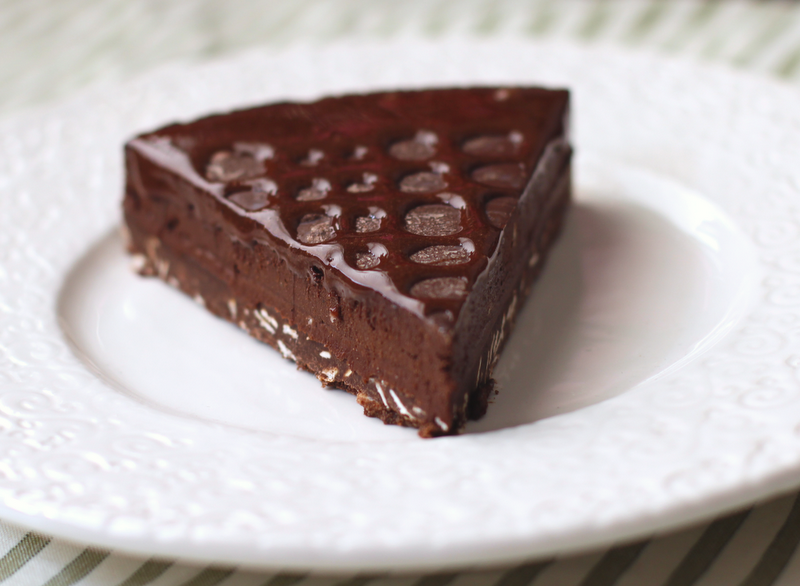 chockohlawtay: Quintuple-Chocolate Dark Chocolate Truffle Tart & Chockohlawtay Turns One! 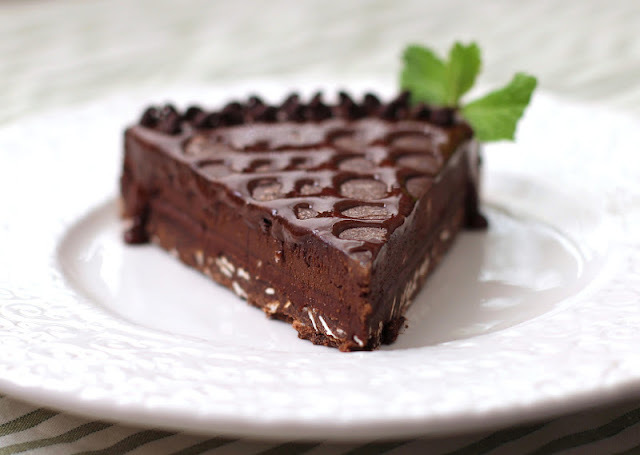 Quintuple-Chocolate Dark Chocolate Truffle Tart & Chockohlawtay Turns One! it must be quintuple. Yes, you read that correctly. 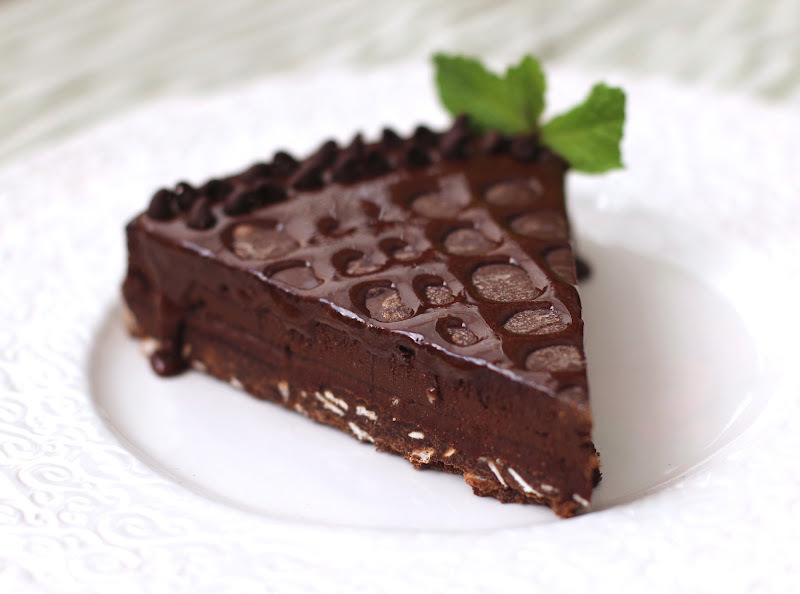 The chocolate oat crust is perfect -- it melts right in your mouth! 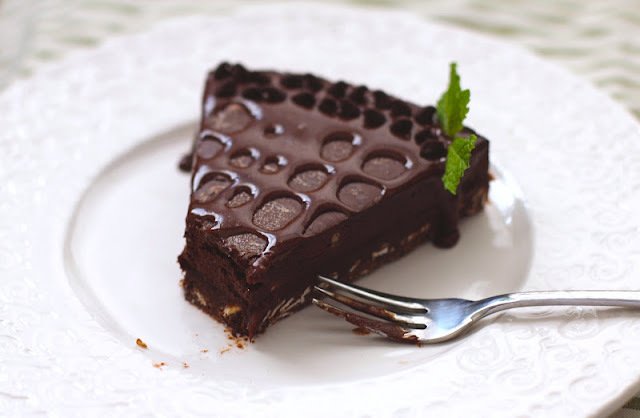 The chocolate coffee ganache enhances the richness of the chocolate. The chocolate ganache is like the center of a Godiva truffle, just on a larger scale. The chocolate glaze is smooth and absolutely stunning! And the mini chocolate chips, just a little extra dazzle for such a special tart. *I used hazelnut extract because I found out I'm allergic to vanilla (I know, it's terrible and slightly ridiculous), but you can use vanilla or hazelnut, both would be delicious! 1. Spray a springform cake pan with cooking spray and set aside. 2. In a large, microwave-safe bowl, add the coconut butter and microwave at 20-second intervals, stirring between each one, until melted. Add the coconut milk, molasses and extracts and stir together. Once incorporated, add the cocoa powder and stir again. Add the protein powder and salt and stir once more. Fold in the oats. 1. Add the protein powder, erythritol, cocoa powder and coffee to a medium bowl and stir. Add the coconut oil, water and extract and stir again (mixture should be very sticky). 1. In a microwave-safe bowl, add the chocolate and microwave at 30-second intervals, stirring between each one, until melted. 2. Stir in the coconut milk 1/4 cup at a time, then add the three tablespoons. Add the stevia, stir, then add the powdered erythritol spoonful at a time. Pour this mixture over the previous layer and pat the pan to bring it to the edges (I could see some air bubbles so I pat the pan on the counter until they reached the surface--it doesn't have to be perfect though, the glaze with cover it). Refrigerate overnight. 1. In a small bowl, add all the ingredients and whisk. 2. Put glaze into a sandwich bag (or piping bag) and snip a tiny corner and drizzle in your desired design. Top with the chocolate chips. You can either serve immediately or refrigerate for an hour to firm up, but only add the glaze the day of serving as it turns into a shell if left uncovered... overnight... my mistake! Note: This is an extremely rich tart so I would recommend slicing into sixteen (or even twenty) slices. But seriously though, I absolutely adore blogging. I love talking to you guys, responding to comments, answering questions, etc, and most of all, I love cooking up delicious recipes! Okay, okay, I love cooking up delicious desserts. So I hope you are looking forward to another year of posts and recipes on Chockohlawtay! Congrats on your one year anniversary! I know we just met as friends, but after seeing this I am so glad we are. This looks so rich and delicious! Also pretty amazing that it is low in fat. Yes, I am looking forward to seeing more from you so keep them coming and have a great weekend! Tina- Thanks! I'm glad I joined FoodBuzz, the site looks amazing. What a gorgeous tart!!! So glad to find your blog...happy anniversary! WOW, I love chocolate and this looks and sounds delicious! Happy 1 year Anniversary! Wow, that looks heavenly! Happy blogiversary! This is my first time visiting my blog (thanks Tina for sending me) and I think it's wonderful. Will be back! Much congrats on your year of blogging! My blog is like my baby, and I can't wait until we share that special one year moment. Haha. I understand when you say "It's strange how much you come to love something. " I've come to have a way stronger bond with my blog than I ever thought I could. Many awesome things will come for you and your blog! It's great already. Good job, and good luck with the future. Congrats on your blog turning one - is there any better way to celebrate? Thanks! And thanks for adding me on FoodBuzz :) I'm still figuring out how it works lol, but I'm sure I'll be seeing your recipes in my inbox! Holy! Chocolate on chocolate on chocolate...and I've already lost count! That tart is making me hurt inside...the kind of hurt you get when you keep staring at something/someone excruciatingly gorgeous. And happy birthday to Chockohlawtay! it may be less harmful than white sugar/flour version. I come from Poland and I see, that you in America call "healthy" everything, that contains a bit molases, skimmed milk, oats, carrot. Wow lovely photos!, how did you glaze the top in such a pretty way? You share very similar foodie tendencies to me....healthy cakes, a girl after my own heart! Happy bloggoversary! Thanks! I put the glaze into a sandwich baggie and snipped a TINY corner off, then drizzled it in a diagonal pattern. I have some leftover so I just ran it around the edges, that's why the diagonal pattern doesn't reach all the way out (whoops! haha). This is beautiful!! Happy Blog Birthday! Congrats on your first year and this amazing tart. So happy that Tina directed me hear. Looking forward to more. Happy Blogaversary! This tart looks seriously amazing! I am loving all of the chocolate goodness going on here! Happy Blogaversary! I'm in love with this tart!! Looks like a piece of heaven! Droooool. This looks amazing! Happy 1 year!!! So happy to have found your blog! Happy one year! This tart looks divine! Beautiful photos. It's official, I have just found your site and I'm in heaven. Greetings from a fellow Canadian . I'm going to make every single thing here, line it all up in a table, and dive in. What a delightfully decadent corner of the Internet! Sounds like a great idea, I need to do that!! 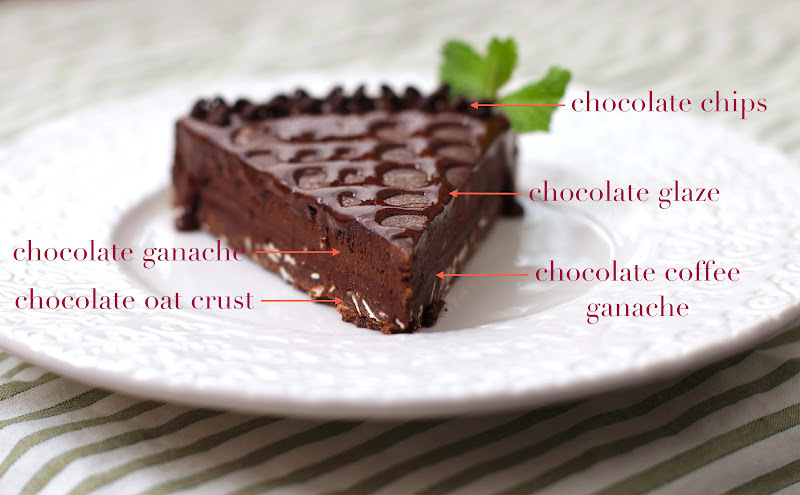 5 different chocolate types in one piece of luxurious cake? You are killing meh!!! !